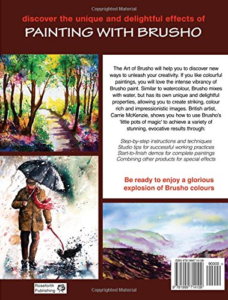 Carrie is a British Artist and art tutor based in Halifax West Yorkshire. Her work is in private collections both in the UK and Internationally. 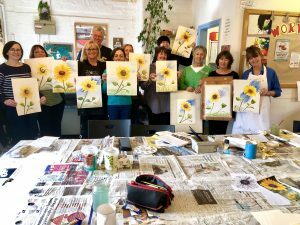 She paints in a range of mediums, specialising in watercolour and mixed media, and enjoys sharing the learning through art classes and workshops. Come and enjoy my friendly and informative art classes and workshops. 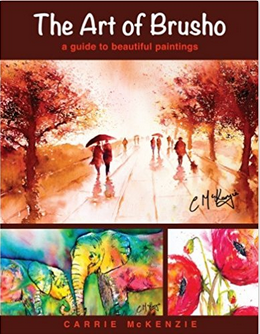 I love sharing the time-tested tips and techniques I have discovered and developed on my own exciting art journey. I will break the subject down into easy to understand sections, and give you lots of guidance and support to improve your own painting. Art is a wonderful way of stepping away from the hubbub of daily life ; in addition to immersing yourself in a beautiful painting for a few hours we always make time for tea and cake! You will find art workshop and other painting tuition dates posted on the TUITION tab above. I also offer mini art demonstrations/workshops to local art societies. With plenty of step-by-step guidance, and a wealth of ideas and techniques, my art book will show you how to create your own beautiful Brusho paintings. Click on the BRUSHO BOOK tab in the menu above for details.